Join Dean, Matthew, and Jessica as they dive into Ridley Scott’s return to the Alien franchise. 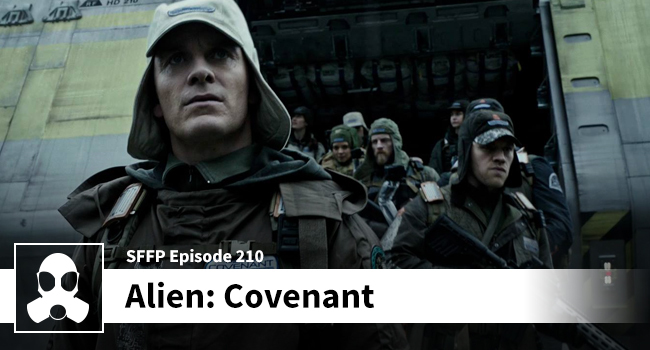 It’s no secret that the glorious hosts at LSG Media are not fans of Prometheus, and consequently, they had low expectations heading into their coverage of Covenant. That said there are still plenty of problems with this go-around, and we are starting to see that Ridley Scott’s breathtaking vistas aren’t enough to overshadow whisper-thin characters and dialogue that is, at times, outrageous. Is Danny McBride the highlight of this film? Spoiler: It’s probably Fassbender, but outside of being named Tennessee and having a cowboy hat, McBride is one of the more believable characters in this flick. Ultimately, this film suffers from the same problems that Prometheus did: it’s trying to be smarter than it is. One the one had you have alien schlock and on the other you have passing fancies into the philosophical underpinnings of David’s synthetic morality. You should watch it, but it is what it is… not that good.